The photo on the left is a physical representation of the water on Earth scaled to fit on an Earth with a radius of 40 cm (about 15.74 inches). The model is inspired by a graphic on the USGS website showing what all of the water on, in and above the Earth would look like if it was collected into a big drop and placed back on the globe. To give a sense of scale the image shows the spheres of water sitting in the middle of the continental U.S.
One version of the illustration give additional perspective by showing two smaller spheres. The larger of the two smaller spheres represents all of the liquid fresh water on Earth. The smallest contains only the water in lakes and rivers. This smallest sphere represents the majority of water used by humanity. The full description and context of the visualization is available on the USGS website. The physical model above shows the same information. 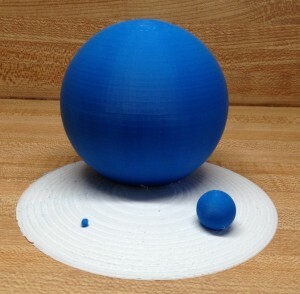 Each blue sphere is to scale. The largest one is all of the water on Earth. The mid-sized sphere is all fresh liquid water and the smallest is lake and river water only. The white base is a small slice of a sphere equal to the size of the earth at the same scale. 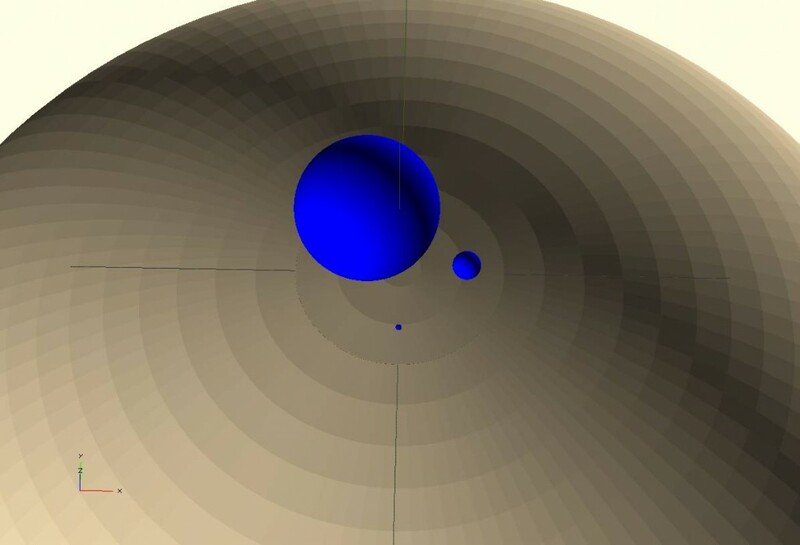 The image below shows the three water spheres sitting on top of a sphere the size of the Earth at the same scale. The files need to print this model are available on Thingiverse.